Mulch of any kind is critical for a desert gardener. Even rocks help! Question: I’ve heard that mulches can improve water quality—is there a connection? Aren’t they just for landscaping? 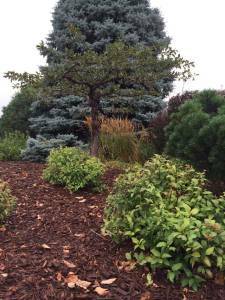 Landscape mulches come in wide arrays of colors and textures. Pine straw is common in some areas, shredded hardwood bark in others. Mulches can even be cocoa hulls or gravel. They help conserve moisture and suppress weeds, but how well they do those jobs, or how often they need to be replenished, varies from mulch to mulch. However, mulches do more! After eyeing countless, unplanned, bare soil footpaths winding through urban landscapes, one of my recent graduate students, David Mitchell, wanted to study how mulches affect water runoff and sediment transport. Many rain simulations and muddy, field data collection days later, he had his results on eight different mulch types. His findings have really made me rethink the role of mulches.